If you are ready to get your garage in order, one of the first tasks on your to-do list should be choosing materials for your garage floor. Boston Garage believes in providing garage flooring that will provide you with a durable, wear-hearty surface that looks good enough for visitors and entertaining. Not everyone uses their garage for entertainment purposes, but if your backyard barbeque gets hit by rain, your guests can wait it out in your garage without an unsightly floor to mar the experience. Boston Garage has six different levels of materials that can be combined depending on your garage usage and the current condition of the garage floor. Not all six layers are needed; most customers use a combination of two layers to refinish their floor. New England garages generally require a concrete primer which allows the material to fully penetrate the concrete slab and create a solid bond. There are two primary design choices--solid color or decorative chip. These are primarily a personal preference without any reduction in durability or function. Extremely durable surface bonded to concrete base in high-gloss finish available in numerous colors and combinations. With all of the materials and design options available, it may be confusing as to which you should choose. 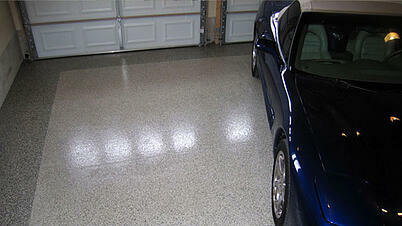 Boston Garage can assess your current garage floor to determine which materials work best for your situation. 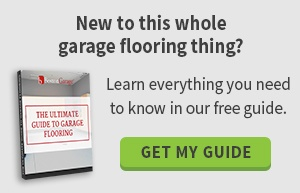 Once your base floor has been determined, you can consider your garage use for the best option. If you like to entertain, a decorative chip or tile design would give your garage an indoor look that would impress your friends and neighbors. For a more industrial use, the solid color choice may be your best option. Working with Boston Garage, you can browse the wide range of styles and options to find the best fit for your garage whether you use it to tinker with your collection of vintage cars or hold your children's toys.